Camping on St. John is usually not top of mind for most travelers planning their next Caribbean vacation. It can be easy to fall into a little bit of a rut when it comes to beach vacations–wanting everything easy and done for you. No one is knocking all-inclusive vacations in Cancun, but sometimes you want something a little bit different! The notion of unzipping a tent and peaking my head out to a spectacular sunrise was all I needed to dig into it more. Not to mention the fact that these pristine views lack the big time price tag that accompanies so many of those resorts. We loved camping in the Grand Canyon, but were unsure about camping in the Caribbean. To get a better idea of what we might be in for, we spoke to a few frequenters of the Caribbean and learned some more. The U.S. Virgin Islands, made up of St. John, St. Croix and St. Thomas, may be best known for protecting more than two-thirds of its land as national forest. As such, you’ll be hard-pressed to find any resorts, condos, cruise ports or airports on the beaches of St. John. But don’t let that deter you– there is still a town with private villas and a few hotels scattered among the pristine, natural island. It’s for this reason you’ll find yourself returning to St. John over and over again. Packing for any trip requires planning, and it’s especially true for camping trips. We’ve talked about what we pack for backpacking and weekend getaways, yet packing for camping in the Caribbean is an entirely different undertaking. Unless you want to pay outrageous bag fees, you’ll have to be smart about what you bring. Luckily, there are two main campgrounds on St. John that provide many of the amenities and camping supplies you’ll need. They offer things like clean sheets and towels on a weekly basis, as well as small kitchens with basic cooking essentials. Although most of the regular St. John’s campers recommended bringing select dry goods from the states, you can still find a handful of food and drink options when you arrive. There are grocery stores in St. Thomas and St. John that have adequate selections, and St. John has several great restaurants where you can easily dine out for any meal you don’t feel like cooking. In the end, the simple island lifestyle makes your packing list a short one. You’ll want to bring enough to be cosy and comfortable in the evenings (read: slippers and games) but you won’t need much else. The must-haves include swimsuits, coverups, sandals, snorkel equipment, and, of course, a camera! We’d be lying if we said traveling to St. John from the U.S. was always a breeze. Chances are you may need to change planes a few times. But at least United States citizens don’t have to worry about immigration. Since it’s part of the U.S. Virgin Islands, you actually don’t even need to bring your passport. That said, it’s recommended you bring it anyway. If you’re feeling adventurous, you can rent a boat from the island and visit some of the nearby snorkeling locales. Some of the daily snorkeling trips hop along the neighboring islands, and these will require a quick visit to customs and another stamp in your passport. All well-worth carrying the extra ID. Once on St. John, the easiest way to travel the island is via a rental car or, our favorite, a 4×4 vehicle. Whatever you rent, make sure you get a vehicle that can carry you across the rugged island roads in ease and comfort. By car, you can travel from one end of the island to the other in about 45 minutes. But don’t let the ease of exploration fool you– there is no shortage of things to see and do. If you’re visiting St. Thomas too, you can rent a car there and take it with you on the ferry to St. John; however, this ferry only runs a few times each week, so you’ll have to plan accordingly. It may well be easier to just rent a car when you arrive in St. John. The bottom line is a sandy one. Camping on St. John will leave you with a remote, pristine, family-friendly, and affordable Caribbean beach vacation. If you’re looking for an adventure, getting to St. John is just the start. There is surely enough to see and do on the island for more than a week-long stay. 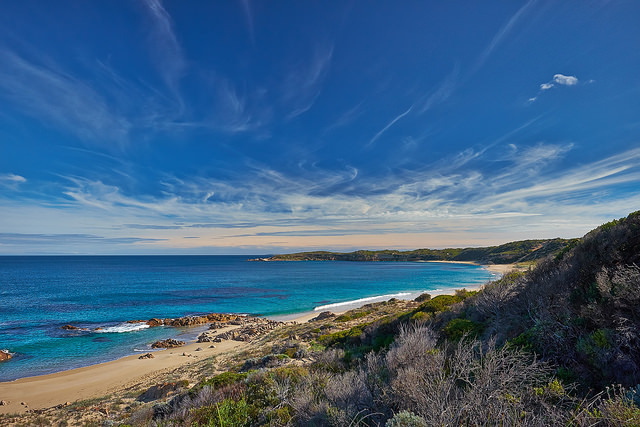 That said, the beach is easily the main attraction for this destination, and you’ll be lucky enough to sleep surprisingly close to the ocean. THAT is what makes camping on St. John such a memorable experience! Not sure where to start? 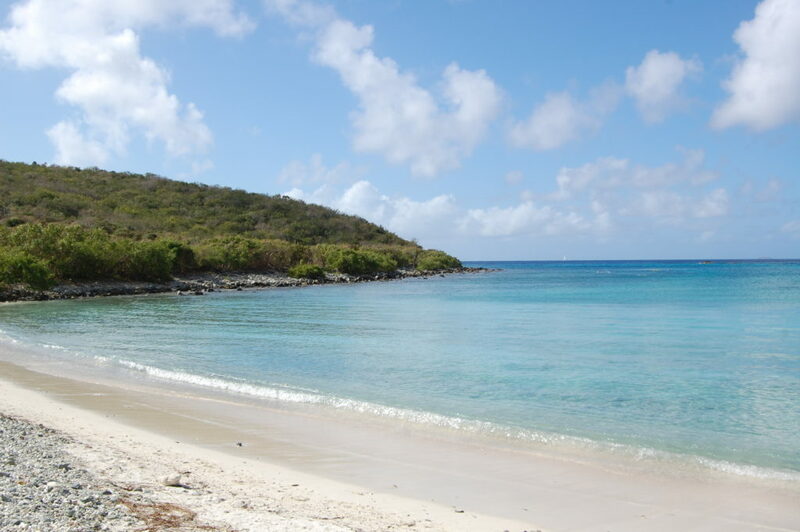 One of the main campsites with camping accommodations is the Cinnamon Bay Campground on St. John. For decades, they’ve been catering to guests with rave reviews who return time and time again. But be aware that they run on island time, so patience is encouraged when waiting for a response. If that wasn’t reason enough to book well in advance, they often sell out of spaces a year ahead of time. Better get started!